Apple is rumored to be working on a subscription-based service that will be offered in the Apple News app, and hints of that service were discovered in the iOS 12.2 beta. Apple in 2018 acquired subscription-based digital magazine app Texture, leading to rumors suggesting Apple would develop a subscription-based news and magazine service. Apple appears to be testing such a service internally based on images found in iOS 12.2 by 9to5Mac. 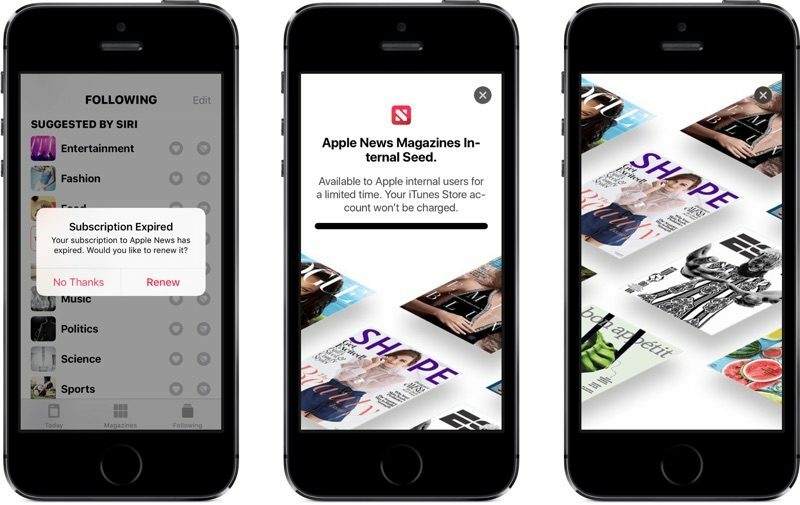 A hidden landing page indicates Apple is going to call the service "Apple News Magazines," with customers able to subscribe in the Apple News app. Billing appears to be handled through iTunes, much like Apple Music, and there are also reportedly hints of a "bundle subscription," suggesting rumors that Apple will develop an all-in-one subscription option for TV, Apple Music, and magazines could be accurate. The interface for Apple News Magazines is similar in design to Texture. Texture, which is still available via the App Store, provides access to over 200 popular magazines like People, The New Yorker, Time, National Geographic, Shape, Newsweek, and more, all for a $9.99 per month fee. Apple News Magazines could work similarly, though rumors have suggested it will also include news subscription options, and pricing is unclear. In September, Apple was rumored to be aiming to get major newspapers like the Washington Post and the New York Times to join its subscription service. Late 2018 rumors indicated that Apple would launch its subscription news and magazine service in spring 2019, which could line up with the launch date of iOS 12.2. Apple has also held a March event for the last several years, and if such a service is in the works for spring 2019, a March event would be an ideal time to unveil it. Early 2019 is also the prospective launch date for Apple's rumored TV streaming service, so it's quite possible both this news service and the TV service will be announced at the same time. Let me anticipate this... It'll be available only in the U.S., UK, Australia and, now, Canada as well? Let’s hope the subscriptions aren’t just to PDFs like Texture. Reading a PDF on a mobile device wasn’t worth the low price of the Texture subscription. Far better to have a dedicated app with responsive formatting. All-in-one with TV, Music, and Magazines sounds amazing. IMO, Individual plan should be no more than $19.99/month and Family plan should be no more than $24.99-$29.99/month. I’d like to see a bundle that includes music, tv and magazines for $20-30 a month for a family. My wife and I would get it for sure. Bet it's only a few magazines, that are authorized by Apple as politically correct. Most magazines won't want to be part of the Apple machine because of Apple's tax. This will be IMO just another poorly implemented Apple service to keep Wall Street happy and giddy. Do these Wall Street types actually use any Apple hardware? I subscribed to Texture last month and all this time, I keep thinking: what’s the catch? The number of high quality magazines feels too good to be true for $9.99. I paid that much for just GQ and Popular Science. This model is really the future of “print” subscriptions. Newspapers and magazines will more than make up the lower prices per subscriber in volume. Like Apple Music, people are willing to pay a reasonable monthly subscription if it’s simple to subscribe and takes away the burden of having to choose which content to pay for. Many of the people who pay for Apple Music today are those who pirated music because it was the easiest way to get all the content you wanted and there was no reasonably priced legal way to do it. Nobody was going to purchase thousands of dollars to get all the albums they wanted but they’ll pay $9.99 to get open access to all music. I’m expecting the same to be true for print media. Over here at n the UK we have Readly, a magazine subscription app that has 100s of premium magazine with a great UI. To be honest it’s marketing dept has been asleep for some years, few people seem to have heard of it, but I’d be pissed if any Apple offering saw the end of it. Still, Spotify seems to have survived so here’s hoping. LOL. Better stay out of the prediction business. Apple already has 100’s of magazines signed up through its Texture app.